Welcome back to the 15′ Growing Dome! We are glad you’ve decided to join us again. Following along with our project will continue to provide you with valuable gardening tips and information, as well as show how, really, anyone can grow fresh, nutritious food in a Growing Dome, all year round! Thinning vegetable crops is a very important step gardeners must take to ensure a bountiful harvest. When planting seeds, either directly or in flats for later transplant, we plant more seeds in one spot than we hope to have mature plants later on. This increases the chance of successful growth because not all seeds planted will germinate. Once these seeds have germinated, however, plant density will be high and the garden must be thinned. Gardeners are quick to pull weeds from their garden but find it difficult to thin out crops. Really, these activities are equally as important to the eventual success of the garden. We pull weeds because they are out of place, undesirable, and compete for water, nutrients and light with desirable plants. Weeds can also attract unwanted pests and disease. Similarly, plants that are too densely packed compete for water, nutrients and light, which reduces the vigor of individual plants. Mold and disease also spread more easily among densely packed plants because of poor air flow and localized high humidity. Although it may seem painful at first, thinning reduces competition for water, nutrients and light among plants, increasing the ability of individual plants to perform well and grow into tasty produce. Thinning, much like weeding, reduces competition, creating more physical space for plants to grow and enabling better access to resources plants need for maintenance and growth. In addition to providing better growing conditions, thinning is a critical part of garden sanitation. Thinning is a cultural method that helps prevent the onset and spread of plant diseases and molds. Ever heard of powdery mildew? That white powdery fungus that you’ve likely seen growing on the leaves of cucumbers and summer squash? This and other fungal diseases take hold and spread most readily when foliage is moist, relative humidity is high and air movement is minimal. These conditions often exist in overly dense stands of vegetable crops, as tightly packed plants block air circulation and readily retain moisture. Many home gardeners also over-head water with sprinklers, a hose or a watering can repeatedly wetting foliage and effectively maintaining ideal conditions for the growth and spread of mold and fungal disease. If a mold or fungal problem does begin, overcrowded plants are also harder to treat because sprays and dusts don’t effectively penetrate or adequately coat dense foliage. Ultimately, thinning your garden is rewarding, both in the moment and down the road. It’s especially important for root crops because they need space to physically expand underground — crowded beets will end up growing spindly greens, and barely develop the tasty roots we desire. Thinning is also important for leafy greens, above-ground crops and root crops because it increases access to sunlight, which energizes chlorophyll. Chlorophyll uses the suns energy to manufacture carbohydrates for plants to use in maintenance and growth, so access to sunlight increases photosynthesis and growth in your plants. This is one of the reasons why plant growth slows when daylight hours dwindle in the winter. When you do thin plants, try to keep in mind the ultimate size of a healthy mature plant. Although your garden may look more sparse at first, as plants mature, everything will begin to look lush and healthy. One technique you can use is thinning in stages, keeping in mind your ultimate spacing goal. For example, if you know your turnips will eventually need to be spaced ~4 inches apart, you could thin first to 2 inches apart and come back again when the plants begin to crowd and thin the rest of the way. This method has a couple of benefits. First, you can eat thinned turnip greens and even the small turnips, so you staggers the thinning task and the resulting harvest. Next, this method can increase your chances of a successful harvest down the road because it preserves more plants for longer, just in case some of the seedlings become diseased or otherwise damaged. Although thinning effectively allows remaining plants to thrive, it has to be done carefully so as not to damage or set them back. Plants can and should be thinned at different stages of growth, depending on type and variety, as well as current conditions. As a general rule, seedlings should not be thinned until after their first set of true leaves appear. If you’ve planted your seeds in flats for later transplant, you can actually separate seedlings when going to transplant, spacing the seedlings according to recommendations on the seed packet and considering mature plant size. If you’ve direct seeded your vegetable crops, you can thin either by uprooting plants around the one you want to keep, or by snipping off plant leaves and stems at the soil surface. Some plants, like peas, beans and members of the Cucurbit family including melons, squash and cucumbers, are very sensitive to root disturbance and should not be thinned by pulling. The most effective way to thin these crops is to clip above ground growth of the plants you want to thin, so as not to disturb the roots of those that remain. Root crops and salad greens are much less sensitive to root disturbance, so uprooting plants surrounding the ones you want to keep is an effective thinning method. If you are going to thin by pulling up plants, select the plant you want to keep, secure it with your fingers, and remove the surrounding plants. After thinning, be sure to water lightly so soil can re-settle around the roots of remaining plants. When deciding when to thin, ensure soil is damp, so there is less risk of root exposure for the plants that will remain. It’s also wise to thin early in the day or in the evening, when temperatures are comfortable both for you and plants. Thinning in the heat of the day is not only uncomfortable for the gardener, but places unnecessary stress on plants. Remember, thinning will be rewarding in the long term, but that doesn’t mean you can’t look forward to it in in the short term as well. Many plant thinnings can be eaten as part of a fresh salad, sauteed, or added to dishes as part of a sauce or spice. 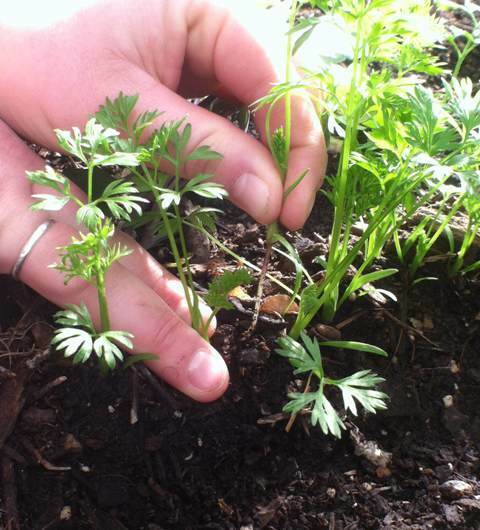 Ever thought of using carrot tops to make pesto, or adding some to your basil pesto? It’s delicious! Some uprooted thinnings, like beets and chard, can also be replanted elsewhere. If you’re curious about this, check out our transplanting guide for more information about which thinnings may transplant well. Of course, thinnings can also be composted and used later as a nutritious organic matter additive to your garden. Be sure to join Jeremy and Dana next time as they discuss harvesting techniques and introduce their tracking system for measuring just how much produce they are able to harvest from the 15′ Growing Dome! Remember, we’ll post updates here on our blog and on our company YouTube channel and facebook page whenever new videos and posts are available.